Found throughout the United States and Canada. Typically near bodies of water including streams, rivers, lakes and fresh and salt water marshes. 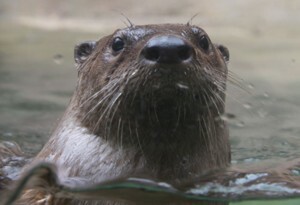 The North American River Otter has a long, sleek body with a long, tapered tail covered in short, dense dark brown fur. Their thick fur helps to protect their skin from the water and allows them to withstand cold weather. They have small, round heads with small eyes and ears and prominent whiskers. Their legs are short with webbed feet and claws. The North American River Otter weighs on average 10 to 30 pounds and measures approximately two to four feet long from head to tail. In the wild, their lifespan is approximately 8 to 9 years; in captivity it increases to about 15 to 20 years. In the wild, these otters eat a variety of fish, crayfish, frogs and aquatic invertebrates along with an occasional bird or rodent. They prey most often on slower fish, such as catfish, carp and sculpins. They use their sensitive whiskers which help them locate prey and catch their prey with their mouth, using their paws to hold on to the prey if needed. In the Zoo, they eat meat, eggs, carrots, variety of fish (trout, catfish, herring, capelin, smelt). Mating season depends on the latitude in which the otter was born. However, it typically occurs in winter or spring. Their gestational period can last anywhere from two months to one year, as otters are capable of delayed implantation. Litter size ranges anywhere from one to five pups. They are born blind and remain in the den to nurse for the first month. At about two months they begin to venture out of the den to play and to learn how to swim and hunt. Otters are known for their playful nature, even as adults. Young are able to fully care for themselves at about six months of age but they do not usually leave their mother until about one year. Males sometimes form a group with other young males until breeding season; otherwise a group of otters is typically a female with her young pups or pups from the previous litter. Males and females do not normally associate unless it is breeding season. For many years otters have been hunted for their fur. In the past, their soft and attractive fur could be sold for a decent amount of money. Otters also help fisherman by eating the less desirable species of fish that compete with the more desirable and profitable fish. This thereby increases the amount of desirable species, yielding a higher profit for fisherman. Otters are at the status of least concern on the IUCN Red List. Specific threats include predation, pollution, and cars. Do not throw any kind of trash, fertilizers, or poisons into any body of water. This kind of pollution could deplete the food supply for the otters. Otters are what we call an “indicator species.” This means that if there is evidence of otters living in a body of water then that body of water is likely very healthy and clean. If there is no evidence of otters in a body of water it could mean that the body of water has been polluted or is unhealthy. The Birmingham Zoo North American river otters are Slim, a male weighing in at 8.0kg (17.5 lbs), and Lenora, a female weighing in at 7.3kg (16 lbs.). Most researchers specifically focusing on otters rarely actually see any wild otters. Otters are very secretive and shy and would rather run away than attack. Because they are almost always very close to a body of water, if they hear a human they can jump into the water quickly and make a fast getaway. Instead of actually trying to spot an otter, researchers look for what they call “latrine sights.” Otters will always go back to the same few spots in their home range to defecate; this is what is known as a latrine sights. Even the otters at the zoo have chosen their own latrine sights. Researchers also rely on game cams that they set up to catch pictures and videos of otters in the night. The torpedo shaped body the otter has allows it to cut through the water in a smooth and fast manner. The otter can close its ears and nostrils when diving. A group of otters is called a “romp” of otters.